During the night of March 1, 1942, in the middle of the ‘wet’ monsoon season, the east and west of Java was almost simultaneously invaded and the last phase in the final battle for the Netherlands East Indies began. The Japanese 48th Infantry Division, about 20,000 men, invaded East Java. Tasked with securing the Tjepu oil fields and occupying Surabaya and its naval base, they landed at Kragan, east of Rembang and approximately 160 km west of Surabaya.. In western Java, where the bulk of the KNIL and allied troops had been concentrated, landings took place near Merak, in the Bantam Bay and near Eretan Wetan. The elements of the 16th Japanese army that invaded western Java did not have a great superiority in numbers. 23,500 men were actually put ashore, while the allied land forces in western Java amounted to more than 27,000 combat-ready troops. It was the air forces that were going decide the battle. The Commander of the Japanese ‘Western Force’, Lieutenant-General Masao Maruyama, split his forces into three detachments. The ‘Nasu’ detachment, tasked with capturing Buitenzorg (now Bogor), reached Leuwiliang on the morning of March 2. There, 24 km from Buitenzorg, they ran into KNIL units as well as the Australian ‘Blackforce’ and an attached US Army unit, the 2nd Battalion 131st Field Artillery. They were held up for two days, partly by the excellent gunnery of the American “D” battery 2/131. The Fukushima and Sato Detachments were tasked with the occupation of Batavia and the port of Tanjong Priok. They initially met little resistance, apart from blown up bridges en and blocked roads. However, the totally unexpected landings at Eretan Wetan proved to be fatal. The Japanese ground forces desperately needed Kalidjati airfield because they could not count on air support from distant fields in Sumatra or Borneo. Thus, Col. Toshishige Shoji’s and his 3.000 troops were tasked with securing the airfield as soon as possible. Shoji’s troops had occupied the Kalidjati airfield on March 1, at noon, despite a desperate defense carried out by 350 British troops. Dutch troops tried to retake Kalidjati during that day and the next but all attempts failed. With Kalidjati in Japanese hands, the Dutch position went from bad to worse, and recapture of the airfield became a primary Allied objective, including attacks by Dutch light tanks. Japanese fighters and bombers started to arrive at Kalidjati on 2 March, but the Allies threw their remaining air strength against the field and managed to neutralize most of the bombers there. But just when Dutch troops began to tighten the noose around the relatively weak Shoji Detachment at Kalidjati, Japanese aircraft suddenly clobbered Andir airfield, putting an end to Allied air support. This in turn allowed Japanese aircraft to maul Dutch ground forces and prevent the defeat of Shoji Detachment. After the Japanese air attacks, most of the [Dutch] vehicles and heavy weapons were lost, there were dozens of wounded and dead soldiers and the morale of the infantrymen had been completely crushed. Kalidjati, Subang, and the beachhead at Eretan Wetan could not be recaptured. After their failures on 3 March, the Dutch withdrew their remaining units from Batavia and the Kalidjati area in order to defend the passes leading to the Bandung plateau, where all the key Allied military HQs and installations were clustered. If Shoji’s troops gained the plateau and captured the city of Bandung and its environs, it would be impossible to maintain Dutch forces in the field and continue the campaign. The defenders struggled to concentrate their troops in key positions, but they simply weren’t fully prepared to fight a modern, mechanized war. While the Dutch struggled to deploy troops to defend all the access points leading to the Bandung plateau, Col. Shoji decided to gamble on a thrust with his entire detachment up the pass through the Tjiater fortification. This fortification was designed to be defended by an entire infantry regiment. Om March 3, 1942 only a reinforced Dutch infantry company initially held the Tjiater position. At about noon on 5 March the first Japanese vehicles approached the fortification. 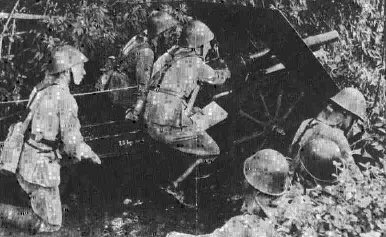 Despite artillery support (although limited due to lack of functioning communications gear) and use of several armoured cars (confined to a narrow road and, with open tops, vulnerable to Japanese grenades), the troops in the fortifications were forced to give ground as Shoji’s infantry pushed forward. As darkness fell, Shoji’s troops gained a firm hold in the fortified position in a pouring rain. The Dutch continued to grasp at straws, but over the next day or two, despite reinforcements rushed from central Java, the Shoji Detachment pushed through Tjiater Pass and captured Lembang on March 7. As West Group (including the Australian-American Blackforce) withdrew from Batavia and Buitenzorg, it finally became utterly clear that the Japanese advance could not be halted, Bandung could not be held, and the Allied position was hopeless. On March 5, the first Japanese soldiers marched into the undefended city of Batavia; Buitenzorg was taken the next day. In East Java, two Dutch infantry battalions, a cavalry unit and the American 2/131 “E” Battery fiercely resisted the Japanese near Surabaya. Facing overwhelming odds and massive air support, they had to break off the fight and retreated to the island of Madura. Three Japanese battalions made a forced march across country towards Tjilatjap (Cilitjap) on Java’s south coast. They reached their objective by March 8 and cut off the last naval lifeline to Australia. With the capture of the Tjiater pass, the road to Bandung lay open to the Japanese troops. Not only were all important allied military and civilian headquarters located there but the city was also filled with thousands of refugees. The Governor-General of the Netherlands East Indies therefore had stated his express wish that there would be no fighting in and around Bandung. Thus, losing the pass meant losing Java. The fight for Java ended with the capitulation of the KNIL and allied units, effective as of 9 March 1942, With the invading Japanese forces already in Lembang and Buitenzorg, a few miles away, the commanding officers had no choice but to surrender. The negotiations took place on March 9, 1942 at Kalidjati airfield. Thoughtful as always the Japanese had lined the road to Kalidjati with hundreds of corpses of those killed in the defence of this airfield . 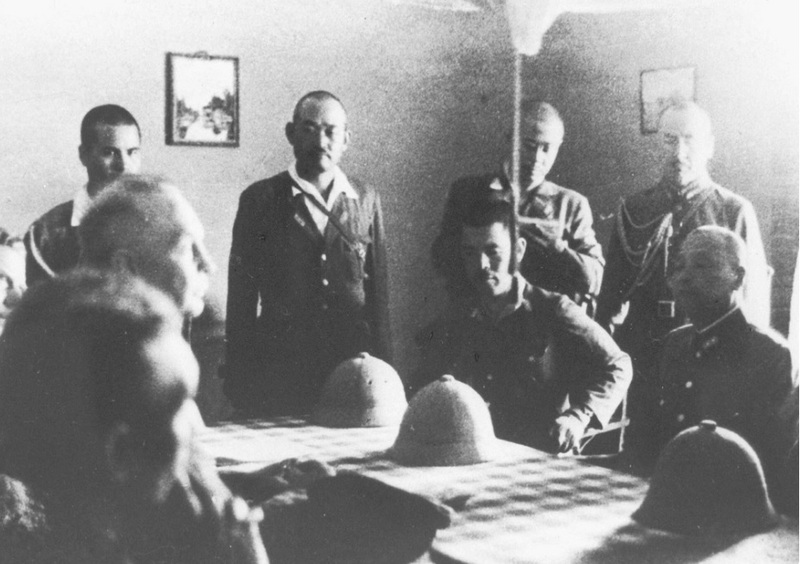 Lieutenant General Hein Ter Poorten surrendered unconditionally to General Hitoshi Imamura and after a few more days all fighting in Java ceased. I am looking for information on the airfields used during the second world war as my grandfather was killed in Java doing a reconnaissance for his unit. – he was seconded from the Manchester Regiment to Special Forces. I will try to help you but the fact that you granddad was on detached duty with special forces will not make it easy to determine which airfield he was scouting out. Can you tell me when your grandfather was killed? Was this in early 1942? Or later? Remember that the British came to Java in September 1945 to establish an Allied government. There were many skirmishes with the Indonesian nationalists during that period. Java had a great number of airfields during the war. When the Japanese invaded, a number of ’emergency strips’, was created. They were actually drained rice paddies covered with rice-straw mats and suitable only for fighters and observation planes, A number of them were later converted into small airfields by the Japanese. Do you know which building in Lembang the Allies used as their HQ – and does it still exist? I will be in Lembang next week. the bloated ABDA command needed a large building so the commandeered the “Grand Hotel” – one of the largest hotels in Java. It still exists – it is advertised under the same name, now as a 3 star hotel with 205 rooms, not far from the city center. I doubt if you will find any memories of the ABDA period but who knows?